Viewing on a mobile device? Click on the three horizontal lines at the top left of your screen to view and use our site navigation. Help the Park. Join the Friends! CCC Interpretive Area Now Open! The new CCC Interpretive Area at South Cumberland State Park is now open. The Interpretive Area, consisting of a new 1/3-mile trail connecting 13 graphic panels, tells the story of Civilian Conservation Corps Company 1475 in words and historical pictures. The trail, in the Grundy Forest area of the Park, is a project of the Friends of South Cumberland State Park, funded by a generous grant from the South Cumberland Community Fund. It takes visitors past the foundations and other remnants of the "village" that housed 200 young men and their leaders between 1935 and 1938, and the interpretive panels weave together the amazing story of the mission and contributions of the CCC to the South Cumberland Region. The site is approximately 1/4 mile from the Grundy Forest trailhead, along the Grundy Day Loop Trail. The walk to, through and back from the site totals approximately one mile. The trail is generally easy, but there are sections with roots and rocks; sturdy walking shoes and walking sticks are recommended! Special thanks to Friends' CCC Team Lead Rob Moreland and Interpretive Area Designer Rick Dreves, as well as the dozens of volunteers, Park Rangers and others who worked diligently over the past 2-1/2 years to bring this fascinating piece of area and Park history to life! 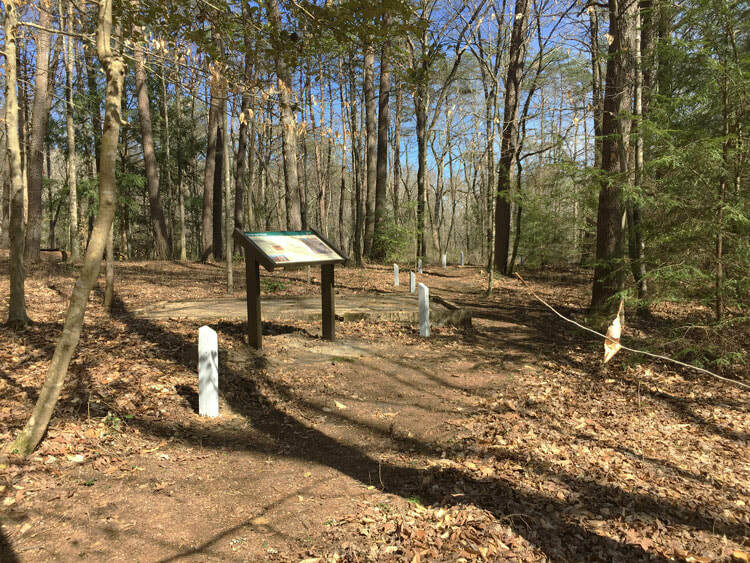 A trail and interpretive signage, part of a recently-completed Friends' initiative, allows visitors to learn about the history of the Civilian Conservation Corps at the newly-opened CCC Interpretive Area in South Cumberland State Park. 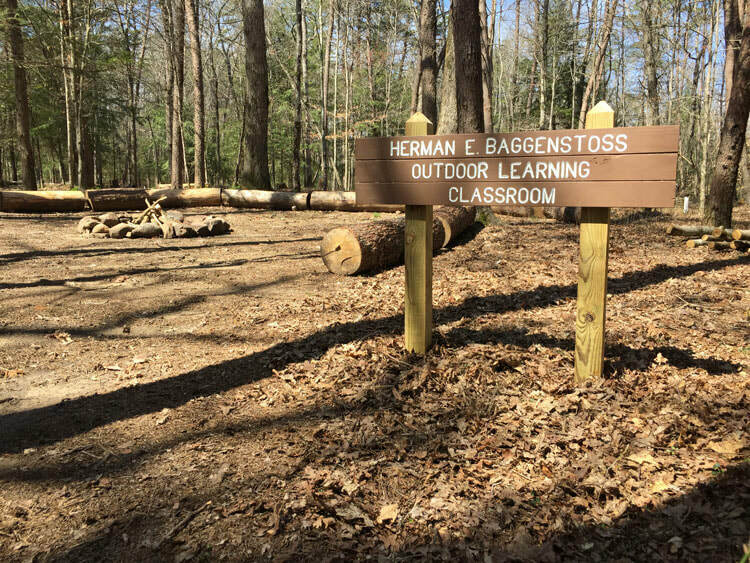 A new outdoor classroom, named in honor of former CCC Superintendent and Tracy City leader Herman Baggenstoss, was dedicated at ceremonies opening the new CCC Interpretive Area. The classroom will be used by the Friends and Park Rangers for school programs, re-enactments, and other educational initiatives. Friends of South Cumberland State Park CCC Project Team Lead Rob Moreland, left, and Tennessee Department of Environment and Conservation Acting Deputy Commissioner Anne Marshall discuss the story of CCC Company 1475 during the dedication ceremonies opening the new CCC Interpretive Area at South Cumberland State Park in Tracy City, TN, on April 12, 2019. Judy Phillips of the Franklin County Historical Society, left, with Tennessee Department of Environment and Conservation Area Manager Chris Padgett discuss the story of CCC Company 1475 during the dedication ceremonies opening the new CCC Interpretive Area at South Cumberland State Park in Tracy City, TN, on April 12, 2019. Now’s the time to enroll for the Spring Trail Friends team! Trail Friends are volunteers who offer Park visitors a cheery welcome and much-needed information about the Park, the natural surroundings, and the specifics of the trails. Trail Friends staff five of the busiest trailheads in the Park, and also walk their assigned trails, answering questions and providing assistance as they go. Some also make detailed recordings of trail features and conditions using the Avenza mapping app. More than four thousand people have been helped by this enthusiastic team of volunteers. The group is accepting new members and on-line training is available now. The Spring Trail Friends season runs on weekends through June 30. If you're interested in volunteering as a Trail Friend for the Spring of 2019, the time to enroll and be trained is NOW! Learn more on our Trail Friends page. Trail Friend volunteer Barbara Braswell (right) helping out fall hikers at Savage Gulf. Congratulations to Ranger Aaron Reid for being named the new Assistant Park Manager at Savage Gulf! He joins Assistant Park Manager Bill Knapp, who will now be able to focus on the central and southern areas of the Park (Fiery Gizzard and Sherwood Forest). Together, says SCSP Manager George Shinn, "Bill and Aaron are my “boots on the ground”, out on the front lines, leading and managing our talented staff, and carrying out our mission of having a beautiful, clean and safe park, so our park visitors can totally focus on having an amazing experience out in nature!" The second annual Goldenrod Gala — a “night out for Nature” and an important fundraiser for the Friends of South Cumberland State Park — went underground on Saturday evening, October 6, 2018. This year's Gala took place in the dramatic new performance hall at The Caverns, which is also the now home to the popular PBS television series Bluegrass Underground. This year’s Gala also featured a "silent" version of the very popular Adventure Auction, offering a dozen opportunities to experience unique places in and around South Cumberland State Park. Even if you couldn't make it to the Gala, you still have an opportunity to donate to its purpose -- to generate essential funding for a wide range of Friends’ initiatives on behalf of South Cumberland State Park. Donate to the Gala campaign! Click to see photos from the 2018 Gala! South Cumberland celebrates 40 years! On July 1, 1978, South Cumberland State Park was dedicated with less than 10,000 acres. Forty years later, it is the largest State Park in Tennessee, at nearly 31,000 acres. Today, the South Cumberland State Park is visited by nearly 750,000 people each year, and thanks to your support of the Friends, is as wild and spectacular as ever, with new trails and new ways to enjoy the park now available through the hard work of our Friends volunteers! Shop Online and help the Park with every purchase! Amazon donates a portion of your purchase directly to the Friends of South Cumberland! Bookmark this page, and use it whenever you shop at Amazon! The Friends are now on Instagram, Snapchat and Twitter! Visited the Park recently...? Tell Us About It! To aid and assist the South Cumberland State Park management and staff in meeting its objectives, and to inform, educate, engage, and inspire its members and the public to protect, conserve, and enjoy all the resources of the park. ​Why Should You Be a Friends Member? Now protecting more than 30,800 acres, South Cumberland is the largest State Park in Tennessee. Although this is great news, more land, and more visitors, creates new and urgent unmet needs for the park. New trails must be built, and existing trails must be maintained or upgraded. New and expanded parking areas, restrooms, camping and picnic facilities, and directional signage are needed. Invasive pests, like the Hemlock Wooly Adelgid, and invasive plants must be controlled. Guided hikes, seminars and historical re-enactments, including programs for area school children, must be prepared and delivered. And, the work of conserving additional environmentally-significant lands is far from complete. By becoming a member of the Friends, you can help insure that South Cumberland will always be a safe, well-maintained and amazing place to experience world-class natural beauty! Your Friends membership directly supports the park. Your membership supports the good work of the Friends of South Cumberland. You will become part of a group working to save great spaces in the South Cumberland and supporting this magnificent park with both funding and volunteer initiatives. You will receive the quarterly FSC Newsletter and monthly Trail Tracker emails to keep you updated on Friends and Park issues, events and volunteer opportunities. You will be eligible for members-only programs and events, such as the Tennessee Naturalist Program. The Friends of South Cumberland is a group of volunteer citizens dedicated to supporting the South Cumberland State Park, at 30,837 acres, Tennessee's largest state park. A 1993 law passed by the Tennessee General Assembly allows state parks to contract with and receive financial assistance from an organized friends group. As a result, private citizens can be involved with and support the park through both volunteer work and financial support. Funding for the Friends of South Cumberland is derived from individual and corporate memberships and from private donations. Our tax deductible status was approved in July 1994. As a 501(c)3 non profit public benefit corporation, your membership and gifts may be Federally tax deductible. Please join us in supporting and protecting the South Cumberland State Park!